View of the entrance. Photo by Adrien Williams. 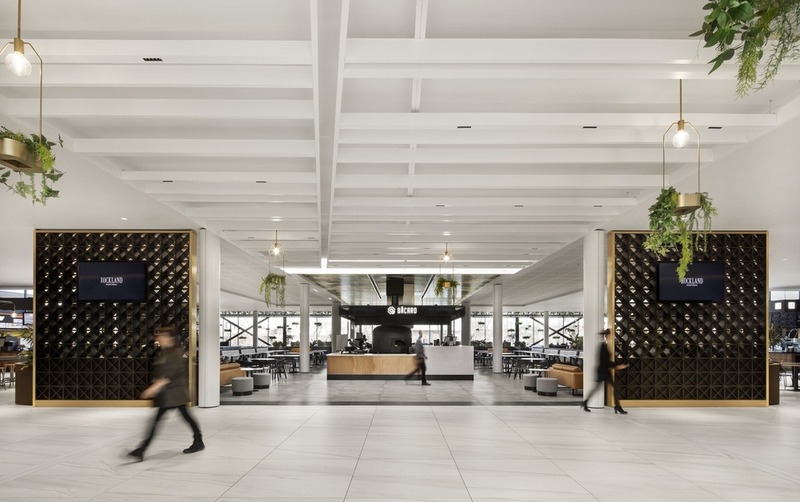 Humà Design + Architecture and Architecture49 have unveiled Rockland Center’s new food court, “La Cuisine”. 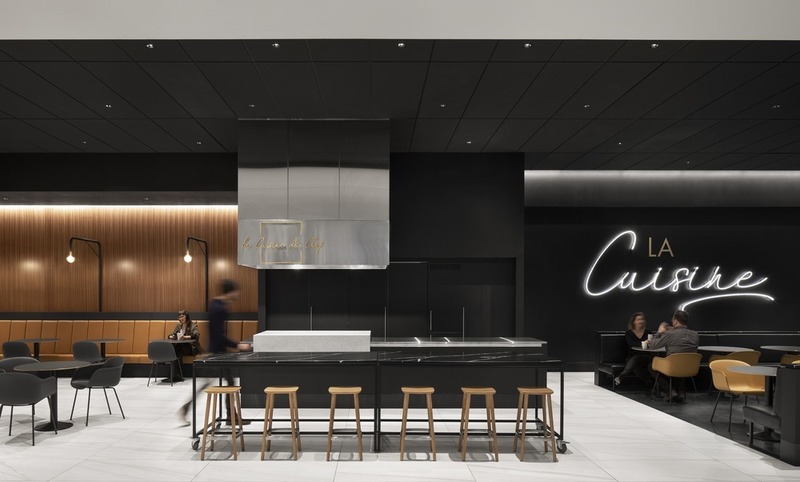 The result of a close collaboration between the two offices, the design aims to redefine the culinary experience in the upscale mall, located just outside the northwestern border of Montreal’s city limits. 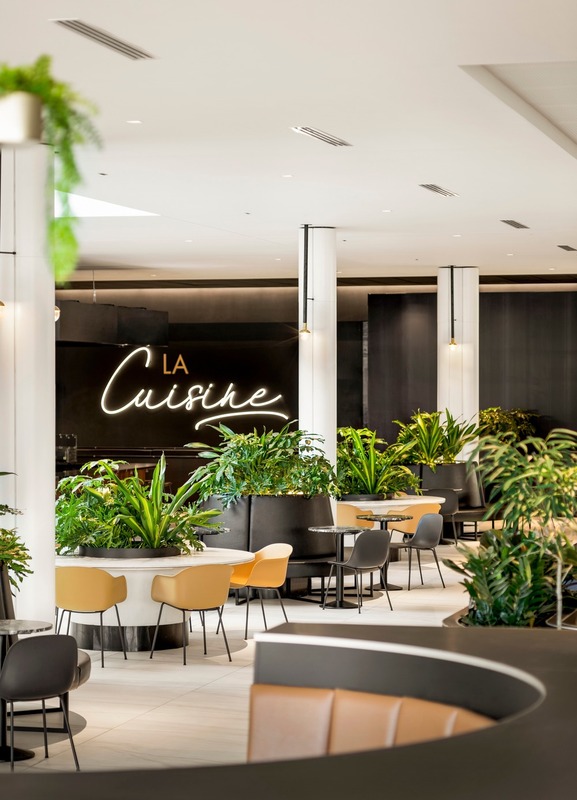 Banquettes present an upscale setting within the “La Cuisine” food court. Photo by Adrien Williams. The Rockland Center was originally conceived by architect Victor Prus, one of the giants of Quebec architecture in the 1960s and 1970s. The Center, which opened in 1959 and garnered a 1960 Massey Medal, was originally designed as an outdoor mall with broad walkways, and was converted to an indoor mall in the early 1980s. Respecting this heritage, Architecture49 + Humà’s design uses modernist design language centered on a large skylight to support the idea of quiet luxury. View of the solarium. Photo by Adrien Williams. “The team incorporated signature elements that recall the exterior […] in the interior space,” says Cardinal. In particular, a large glazed opening towards Acadie Boulevard, known as the Solarium, floods the indoor space (which was previously only artificially lit) with daylight. 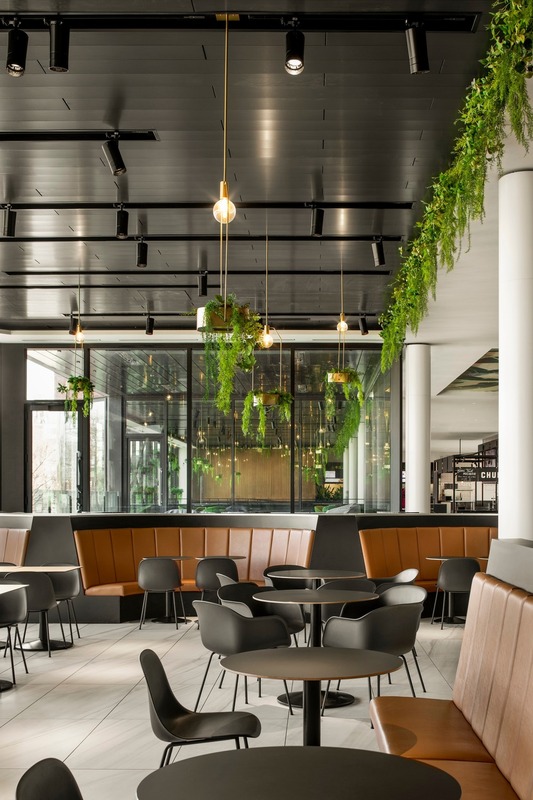 Greenery throughout the interior transforms the food court into a grand garden-like dining room. Created to host prestigious chefs and culinary events, The Chef’s Kitchen is equipped with a large and open countertop. Photo by Adrien Williams. 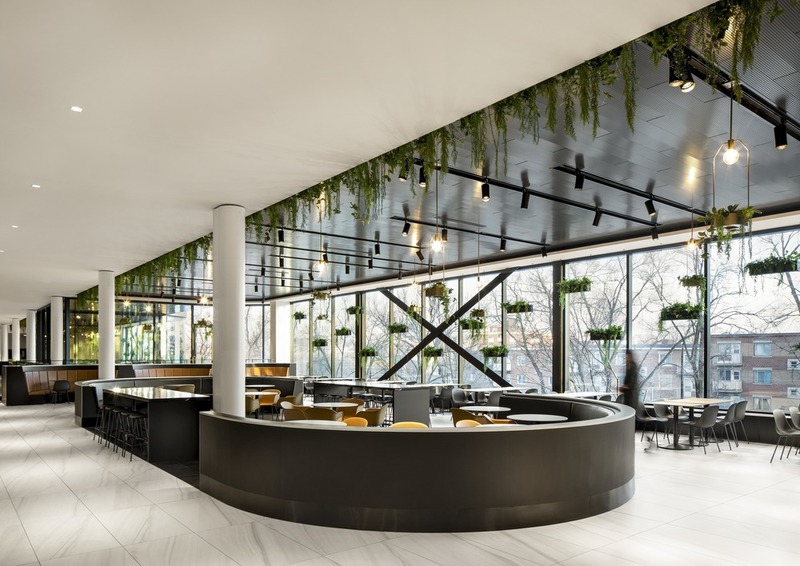 The food court offers many sub-spaces with different atmospheres: from upscale areas with refined details to felted alcoves to appeal to children. High-end materials such as marble, wood, copper and leather are used to accent the design, along with bespoke lighting. View of the terrace area. Photo by Adrien Williams. A central island was conceived as the active heart of “La Cuisine” in a dining-room spirit. It is bordered with high counters and garden-inspired furniture with wooden seats. To support the garden idea, a large exterior terrace was created with fireplaces that allow for four-season use.